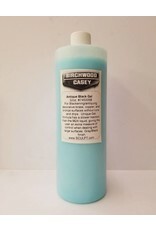 Birchwood Casey M24 Gel - For blackening/antiquing decorative brass, copper and bronze surfaces without runs and drips. Unique gel formula has a slower reaction than the M24 liquid, giving the user an extra measure of control when dealing with large surfaces. Gray/Black finish. Antique black gels - Blackening GEL designed for finishing decorative metalwork. These new GELS are designed for use by both individual metalworkers and for factory-scale antiquing lines. They make the finishing process faster, neater and far easier, reports the manufacturer. The brush-on GELS represent a new, more efficient finishing option to anyone using immersion or swab-on finishing processes. While immersion tank lines are most economical in many factory settings, brush-on techniques prevail in shops dealing with larger workpieces and customized finishes. The antiquing GEL process provides both of these finishers with a faster, cleaner and more cost-effective alternative. Large workpieces using liquid blackeners, for example, are challenging to work with due to difficulties of applying the liquid to a large surface uniformly. Another problem is minimizing the runs and drips during the finishing cycle and re-applying the liquid where needed to carry the blackening process to completion. Following blackening, these workpieces need careful rinsing and drying to avoid any tendency to waterspot or corrode. Each of these steps can reduce the level of operator control needed to achieve satisfactory results. By contrast, the new antiquing GELS simplify the process and eliminates most of these problems. After cleaning the part surface in the normal manner to remove cutting oils, coolants, etc., the user simply swabs-on a generous layer of antiquing GEL with a synthetic paint brush. Then allows the GEL to work for two to ten minutes. The GEL adheres to the metal surface and tones uniformly without running off ï¿½ï¿½ï¿½ even on vertical surfaces. With most parts, no re-application of the GEL is necessary. 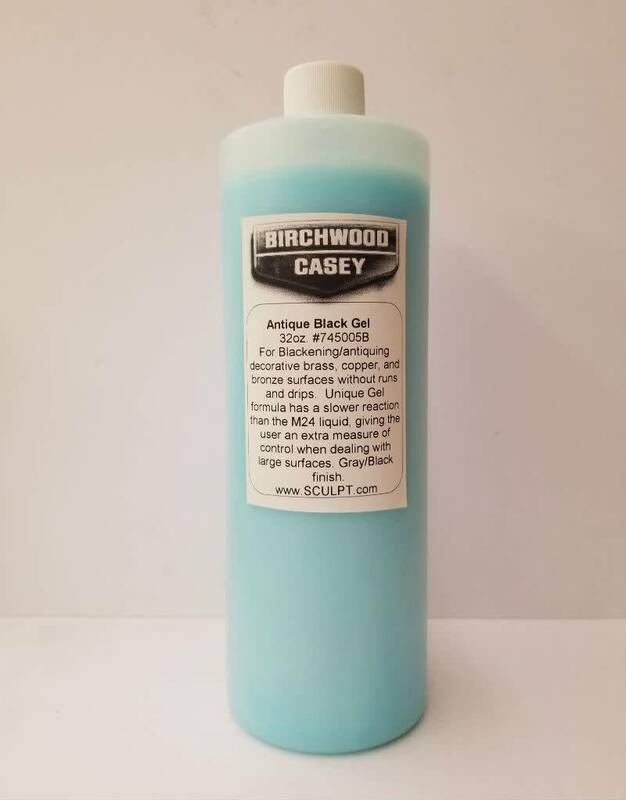 When the desired depth of black tone is achieved, the GEL is simply rinsed off in the normal manner, leaving behind an invisible protective finish which inhibits water-spotting and corrosion during drying. The resultant toned finish is clean and tightly bonded to the substrate and can be sealed and used as-is, or highlighted to produce a variety of attractive distressed finishes.